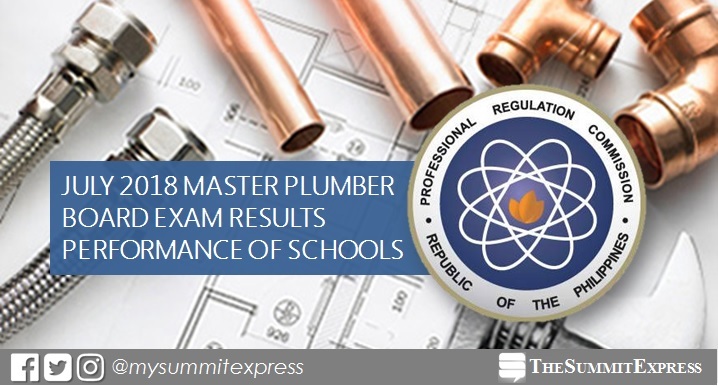 MANILA, Philippines – The Professional Regulation Commission (PRC) hailed the top performing school in the July 2018 Master Plumber board exam. The results are released on Wednesday, July 11, 2018. PRC conducted the licensure exam on July 7 and 8 (Saturday and Sunday) in Manila, Baguio, Cagayan De Oro, Cebu, Davao, Iloilo, Legaspi and Tacloban. Malayan Colleges Laguna and University of the Philippines (UP) - Diliman were named as the top performing schools in the July 2017 licensure examinations, 85.71% and 82.76%, respectively. In the July 2016 exam, UP-Mindanao and University of Saint Louis - Tuguegarao garnered the two highest places, 88.89% and 85.71%, respectively. Monitor this page for the real-time updates on Master Plumber exam results. Check out also the official website of PRC for more information.